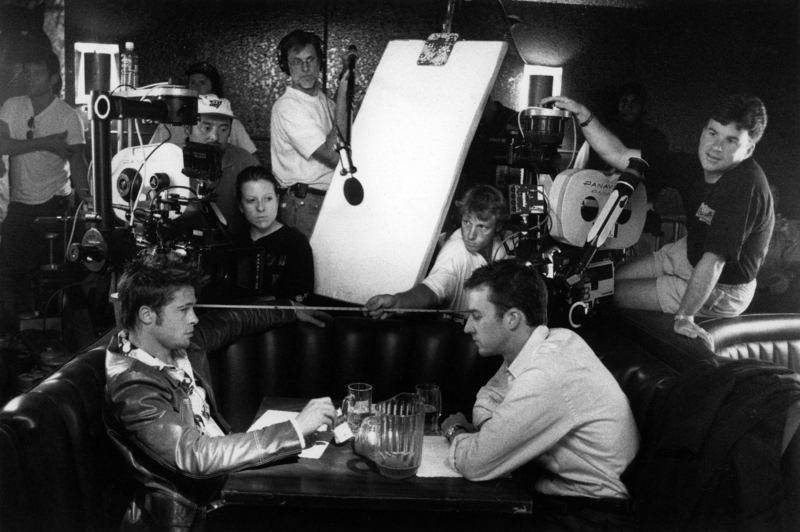 Beyond The Frame: Fight Club - The American Society of Cinematographers , Fincher had already worked with a score of prominent cinematographers on commercials, music videos and feature films. Interestingly, he began shooting Alien3 with Jordan Cronenweth, ASC — who left the production due to his battle with Parkinson's disease and was then replaced by Alex Thomson, BSC. While working with his father on a number of pictures in various capacities, Jeff Cronenweth was afforded the rare opportunity to have a master cinematographer as his personal tutor, mentor and best friend. "I was exposed to filmmaking quite early on," he said. "On summer vacations, I was able to stay with my father on sets, wherever he happened to be at the time. I loved the way the crew interacted, and the collaborations that took place. When I was later presented with opportunities in this business, I thought it would be quite foolish if I didn't at least make a go of it." Cronenweth worked as a loader and second assistant before graduating from high school, and then enrolled in film school at USC, where he studied cinematography. Among his classmates were future peers John Schwartzman, ASC and Robert Brinkmann, as well as director Phil Joanou, who would go on to make three pictures (State of Grace, U2: Rattle and Hum and Final Analysis) with his father. After graduation, Cronenweth resumed working with his father, joining a core camera team that included operators John Toll (later ASC) and Dan Lerner, and first assistants Bing Sokolsky (later ASC) and Art Schwab. Moving up to first assistant, Cronenweth began to work with Toll, who was just beginning his career as a cameraman, and veteran Sven Nykvist, ASC. "I couldn't have learned from better people than John, Sven and my father," Cronenweth said. "They were all soft-spoken, but very tenacious in achieving their goals. It was a great experience to watch them, learn set etiquette and see how they delegated responsibilities and dealt with producers and crews. I did six pictures with my father and eight pictures with Sven." Fostering his son's development in the craft, the elder Cronenweth would often let him handle much of the on-set "grunt work" — establishing the lighting and camera placement — as well as operate. It was this formative period that introduced Jeff to many of the producers and directors who would later hire him as a cinematographer. A key figure in this progression was Fincher, a longtime admirer of Jordan's work who had collaborated with him on a host of music videos and commercials. "Once again, I was fortunate enough to have worked with David through my father," Cronenweth told AC. "The first thing my father shot for David was the Madonna video 'Oh Father.' A little while after that job, David called and asked me to meet him at Panavision to do some pickup shots. When I got there, he said, 'Okay, where's your meter?' I ended up shooting some inserts for the video as well." After a string of projects with the two Cronenweths, culminating in Alien3, Fincher continued to bring Jeff in on projects as an operator after Jordan retired. The young cameraman was hired to operate B-camera on Seven, and several months after that picture had wrapped, Cronenweth was brought in to operate on an extensive 18-day reshoot with cinematographer Harris Savides, ASC (the film's primary cameraman, Darius Khondji, ASC, AFC, was unavailable). However, when the workload proved to be even more substantial than anticipated, Cronenweth was given his own additional unit to shoot crucial pickups, as well as portions of the film's striking title sequence. He later served in a similar capacity on The Game. When Cronenweth got a call from Fincher to discuss Fight Club, the cinematographer — who by then was shooting full-time on commercials and music videos for such top directors as Mark Romanek, Charles Wittenmeier and Matthew Rolston — naturally assumed he was being considered for more second-unit work. He was wrong. "I couldn't think of a better movie to do as my first feature than Fight Club," said Cronenweth. "Although I knew it would be rough, I had so much trust in David as a filmmaker that I had the confidence to do the film. He has such a distinct eye and is such a talented storyteller that the visuals in his films are always a collaboration in the truest sense. His knowledge of the medium allows a cameraman to go to places that other directors would either be afraid of or not understand." You can read AC's complete feature story on the making of Fight Club online here, or order the rare back issue here.